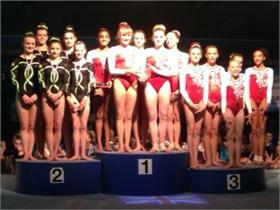 Ireland claimed team silver at the Rushmoor Rose Bowl on Saturday 26th October 2013, thanks to a fine all-around performance from the five-strong team. The team contained 3 of Salto Elite Girls Squad gymnasts Casey Bell, Nicole Mawhinney and India McPeak, with Nicole and India having recently returned from the World Championships in Antwerp. Ireland recorded the best total score for an Irish international WAG team against very strong competition, with Casey Bell putting in a great performance to break the 50 point mark and claim a personal best of 50.3. Ireland’s interest in the competition continued Sunday, where Nicole Mawhinney (6th) and Casey Bell (4th) competed in the vault final, while India McPeak (6th) joined Casey Bell (4th) in the A-Bars final. Congratulations to all teams involved! !